Highlights all leaks even under low pressure. Contains a rust inhibitor making it suitable for use on steel, aluminium, copper and plastics. Suitable for use in the gas, plumbing, heating, automotive, engineering and welding industries. Ideal for maintenance and safety checks on pipework, joints, valves, air lines, cylinders, exhaust, compressors, welding seams, inflatable equipment. 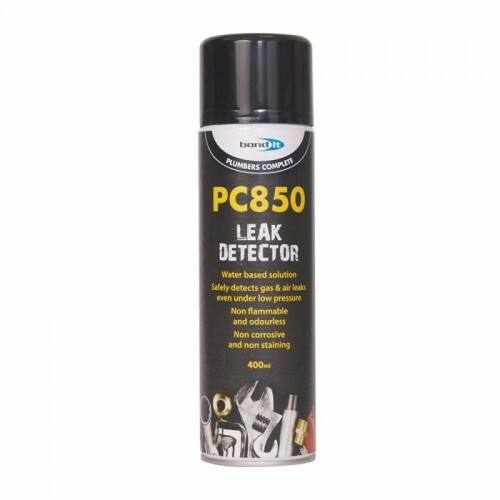 It is also suitable for locating leaks in commercial vehicle air brake systems, pressure vessels and for pressure testing other equipment.Can be used for almost all types of gases. Effective even at extremely low pressure percolation. Contains a rust inhibitor making it suitable for use on steel, aluminium, copper and plastics. Can be used for almost all types of gases.